Caritas teams continue going to villages and bringing soap, bleach, buckets and posters to teach people how Ebola is transmitted. “We recognize that many rural communities in West Africa, including those where cocoa is grown, need support to find sustainable solutions to economic and social problems that may hinder their ability to tackle threats such as Ebola”, said Bill Guyton, president, World Cocoa Foundation. The WCF is an international membership foundation of more than 115 companies that promotes a sustainable cocoa economy. Their membership represents more than 80 percent of the global cocoa market. The WCF effort was spearheaded by a $100,000 initial contribution by the Transmar Group. The donation was announced this week at a WCF event in Copenhagen. The donation is being sent via Caritas Denmark. Jann Sjursen, Secretary General of Caritas Denmark, said, “Ebola is killing people every day in West Africa. Action is needed now to stop the spread of the disease, save lives and support people living with and affected by the Ebola Virus. “The initiative of WCF to support Caritas and the International Federation of Red Cross and Red Crescent Societies is a concrete example of industrial corporate social responsibility for the benefit of those who daily battling with the devastating effects of the Ebola virus”. The main focus in West Africa for Caritas is prevention. Caritas teams continue going to villages and bringing soap, bleach, buckets and posters to teach people how Ebola is transmitted. 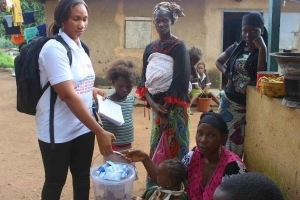 Caritas is expanding its efforts to bring food aid to people in quarantine in Guinea and in Liberia, train community mobilisers at a medical teaching college in Liberia and organise a burial team in Sierra Leone.